Vantaa Energy Electricity Network Ltd distributes electricity to 118 000 customers in Vantaa, the fourth biggest city in Finland and part of the capital region around Helsinki. 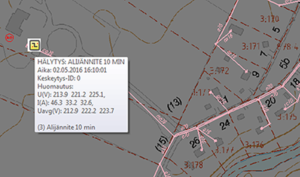 In October 2013 Vantaa Energy Electricity Network took their new Aidon AMM system into use after a couple of months’ pilot phase. At the starting time, the system covered 63 000 metering points and within three years in use, the number of metering points has increased by 20 000. The growth comes partly from the renewal of the old installed base of metering devices, and partly from increasing population in Vantaa, due to which 3000 to 4000 new customers are connected to the grid every year. Customer relationship manager at Vantaa Energy Electricity Network, Janne Hartikainen states that their expectations for the new system were high at the procurement phase, especially in terms of reliability. After having had the new AMM system in operation for three years now, the experiences have met the expectations very well. The high SLA number confirms this: 99.4% of readings are collected into the system by 5:00 o’clock next morning on regular basis. For AMM system’s communication Vantaa Energy Electricity Network uses both wireless mesh and wired RS network. Master energy service devices collect data from the slave devices to which they are connected and transmit the data to the reading system via mobile network. Point-to-point devices in individual sites transmit their data directly to the reading system via mobile network. In addition to system’s reading reliability and performance, Hartikainen emphasises the importance of utilising the AMM information in DSO’s operation. As an example he mentions the information from metering devices which helps to trace incorrect measurements or faulty meter connections at the customers. This is an important part of quality control, in order to ensure correct invoicing to the customers. Around 25% of the energy service devices at Vantaa Energy Electricity Network Ltd have the PGM (power grid management) functionality for low voltage network monitoring activated. PGM reveals faults and deviations in the electricity supply to the customers, such as voltage deviations and 0-wire failures. In case of failure or fault at the customer’s electricity supply, the energy service device detects it and its type, and sends an alert to the operation centre’s Trimble DMS system, which shows the type and location of the fault. Early alerts about 0-wire failures are especially important in order to eliminate the related risk of danger to people’s safety or damage on properties. Electricity meter, traditionally used mainly for billing purposes, is nowadays an essential part of the grid operation in Vantaa. In correspondence with this, the AMM related responsibilities – the former metering department – at Vantaa Energy Electricity Network Ltd are now organised under Connection services and Grid services. Connection services take care of the physical operations related to customer’s connection including installation and lifetime management of the metering device. Grid services focus on meter reading and processing of metering data, so that the operations department can use the information to track and fix errors in the network. According to Hartikainen, the new operational model allows for more efficient way of working and thanks to this, the need of field resources has gone down by 50 % compared to the starting point in 2013. The effectiveness comes partly from the availability and utilisation of the AMM information which helps the installers to plan and perform their work more independently, with less time spent on searching the faults and problems in the field. Also, as the AMM system itself performs reliably, its operation requires much less attention.